Happy New Year, Friends. 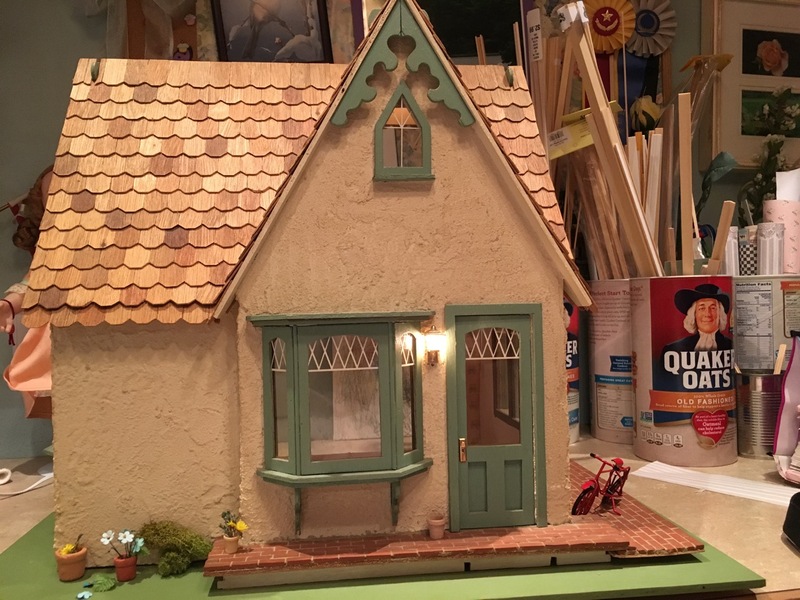 I don't often do this, but this week I am combing my two blogs, Welcome to the Garden Spot and Ann's Dollhouse Dreams simply because I have more to write about on the dollhouse blog than I do about the garden right now. For my miniaturist friends, I join Angie at Letting Go the Bay Leaf for Mosaic Monday from the Garden Spot with three requirements: posts must contain a collage or mosaic, they must provide a link to Mosaic Monday, and we visit other Monday Mosaic participants. For the Garden Spot friends, you will get glimpse of what I do when I'm not in the garden. Here at the Garden Spot, life has finally slowed to a dull roar. The last of the holiday birthdays is here--the Head Gardener's is today and then we have a break until late March. 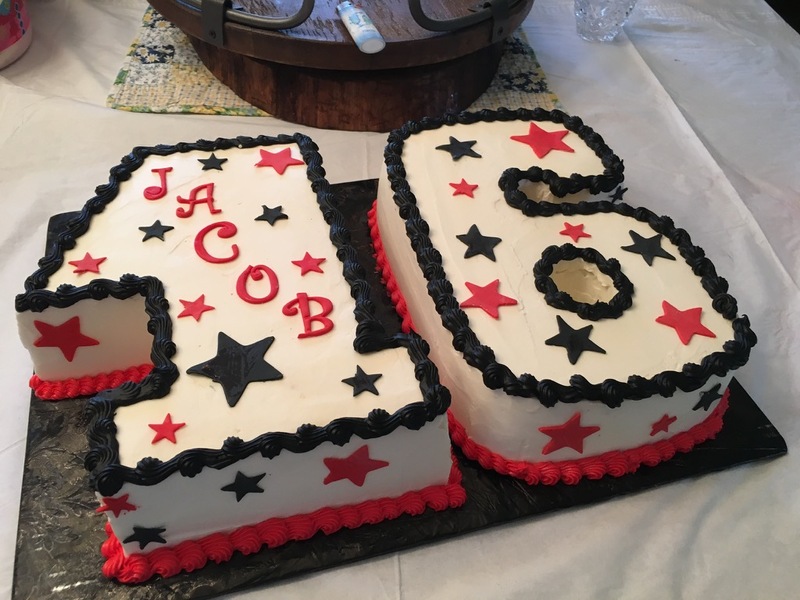 We celebrated the "milestone" birthday Saturday as our grandson Jacob turned sixteen. He is growing into such cool kid and fine young man, too. We are, naturally, very proud of him while left wondering how did he get this old so fast? When I look outside to the yard, I shutter, realizing that we will have so much to do when Spring comes bouncing in. Brody has had the yard to himself and has learned to entertain himself. Once a shy boy, he seems to be gaining enough confidence in himself to play outside alone. The HG finally got the electronic fence installed, so he wears a collar that warns him when gets to the invisible barrier with a more than gentle buzz to his neck. As a timid dog, he may not wonder too far anyway, but he is also a short hair pointer and they do love to run. He has done quite well at entertaining himself, most notably by destroying the drip system in both the vegetable garden and the flower beds around the house. We are short on moisture, so the landscape wears its winter brown. While we enjoy our days of sunlight and mild weather while we worry that we are in the midst of a drought. 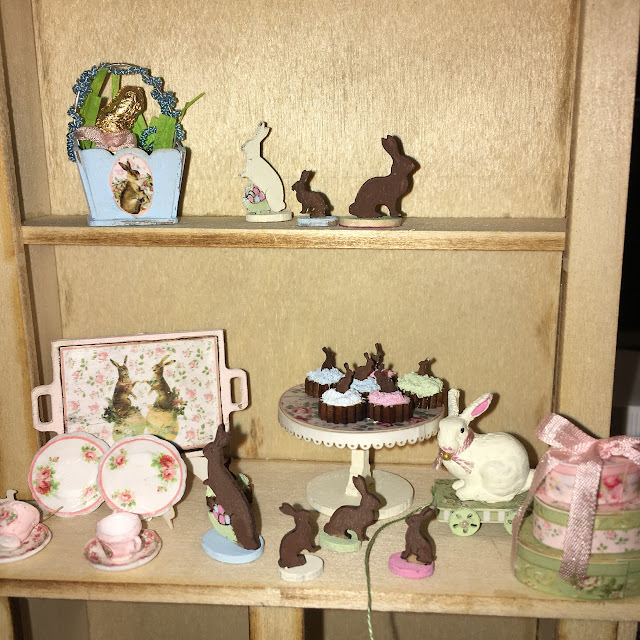 One of my Christmas gifts was a 1:12 hutch with lots of Easter goodies to assemble. Next to Christmas, Easter holds special memories and moments. More that just the chocolate bunnies, colored eggs, and sweets, Easter morning service is always special. My mother often treated herself to attending sunrise service at Red Rocks amphitheater west of Denver, truly one of the most spectacular places to worship on Easter. (For images of the famous music venue you search for images of the outdoor theatre, a truly spectacular natural theatre). So, of course, I have lots of memories that float around in my mind as I work on these tiny little creations. So far the bunny pull toy is my favorite. With Lily's house finished, I am wondering what my next project will be. I do have to finish the San Franciscan, but I will have to move it in from the garage, but other than that, I don't see any new builds in my near future. 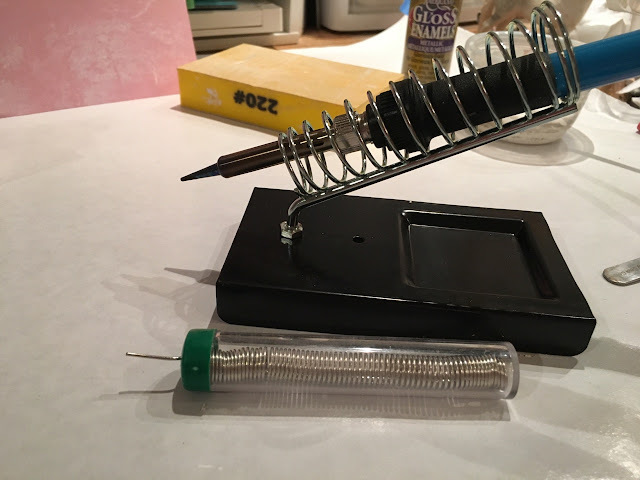 I have work to finish on the Bellingham, too, but I have started to play with the Storybook, the little toy store that I bought a few weeks ago. It is so cute and so old. 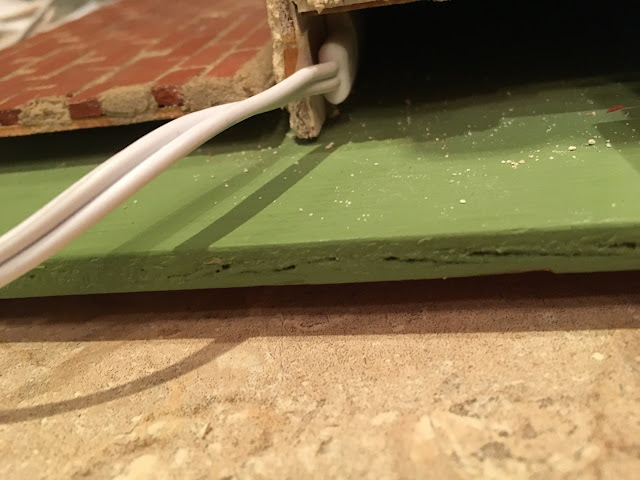 I finally plugged in the electrical to see if it worked. 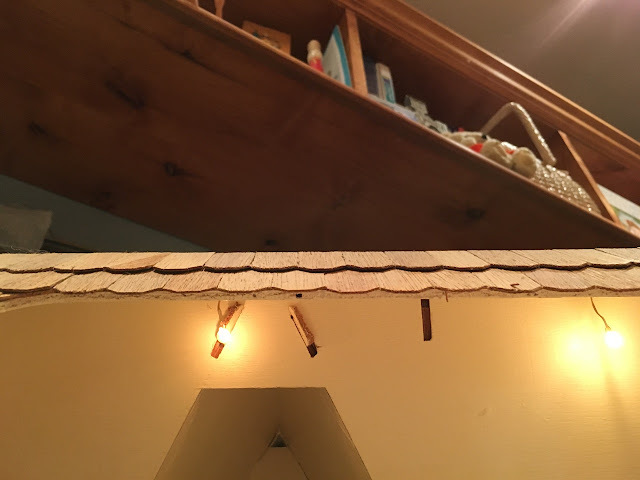 The attic lighting is hidden underneath the bit of roofing, but the lights shine brightly. And so do the lights downstairs. I played around with the idea of adding a wall to add more interest to the interior since the little house will be loaded with toys, but then I came upon another idea that I will share with you later. The renovations pose certain problems with the main one being the wallpaper and how to redo the wallpaper. I'm working that, too. I am thinking that I use scrapbook paper instead of actual wallpaper. I just have find the right paper. I am thinking of green or maybe baby blue. I am a pink person. I love pink, and I always think pink, now I am thinking blue. I do like the wall and I think I can get it cut on the scroll saw, but I kept playing and came up with a better idea. I want to create a little reading nook in the toy store, thus I want some sort of division. Lastly, here is the find of the week. I had to pass because the house is probably over priced at $400, but what a a nicely built, solid house that would be a great project. The furniture includes 2 great pieces, an up right piano in very good condition and that canopy bed that is so unusual and certainly vintage. The house is lighted with beautiful stained glass chandeliers, one of which is missing its shade. I am guessing that it was not a kit house because the workmanship is wonderful. I believe that the original owner is selling it. It is located in Eaton, Colorado in an antique store called Back Alley Arts if anyone is interested. The house has so much potential, but my village has reached its limit--for now at least. Thanks so much for visiting. If you have come here for the first time, say hi. I'll be back in the garden soon. Linking with Angie for Mosaic Monday. Join us. It's fun. Ann - I have only visited you at Garden Spot, so I had no idea you had this whole other life! How wonderful! 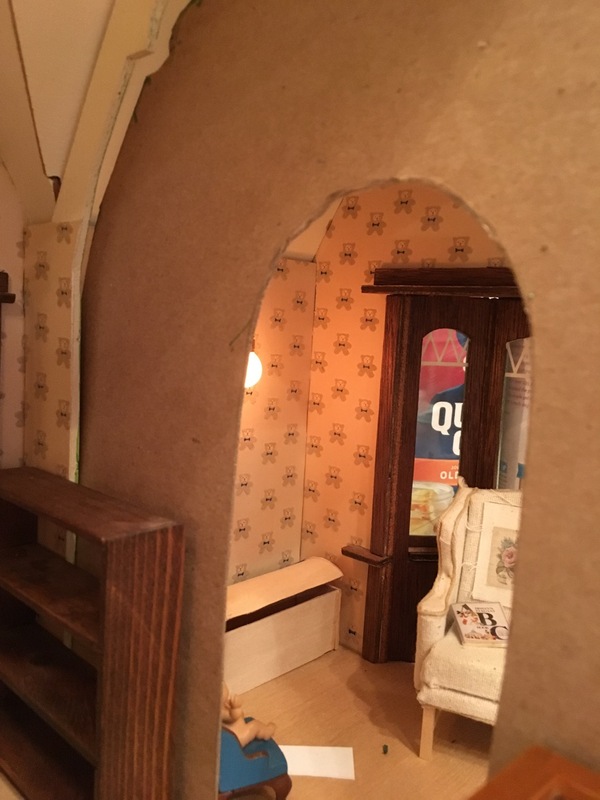 I am so grateful that you combined your posts this week so that I could get a peek into your delightful, wee world of doll houses and miniatures. 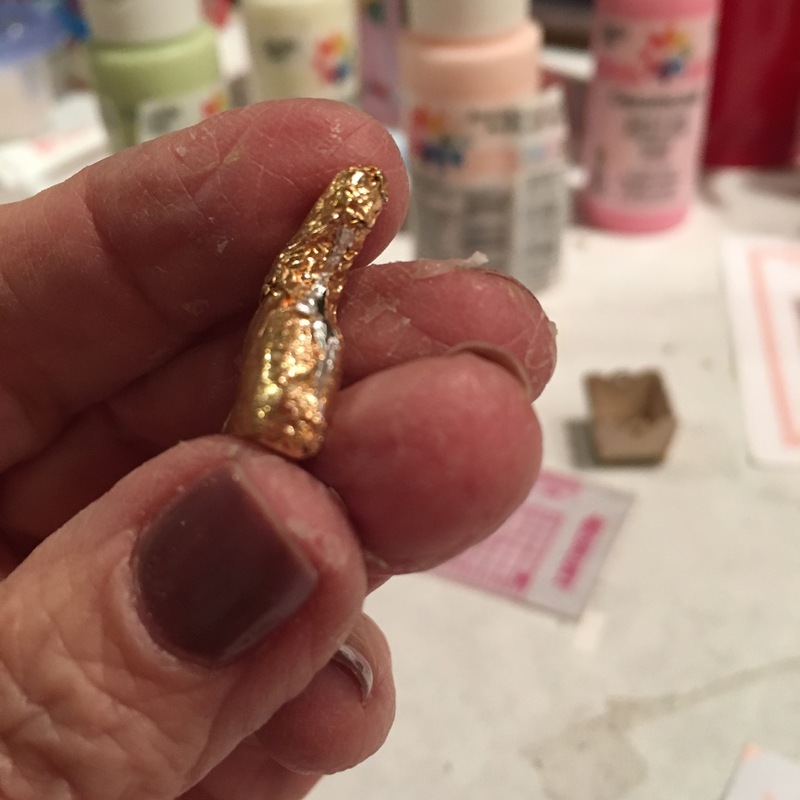 I could not get past the size of that microscopic golden (candy?) 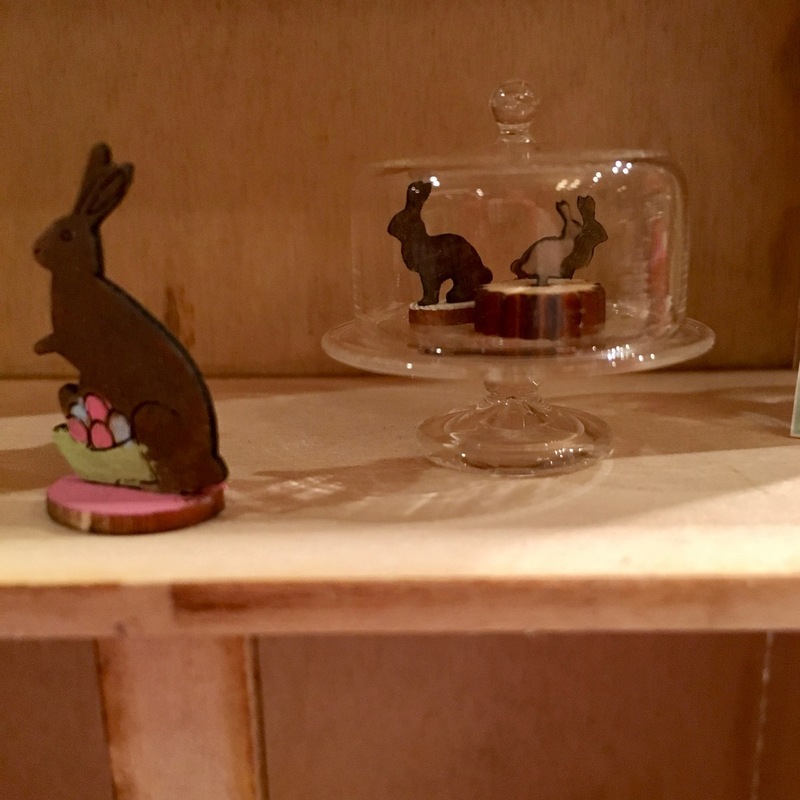 bunny in your hand … until I saw the upright piano - so reminiscent of the one sitting downstairs (just a little bigger …) I love this addition to Mosaic Monday - thanks for linking up this week, my friend! 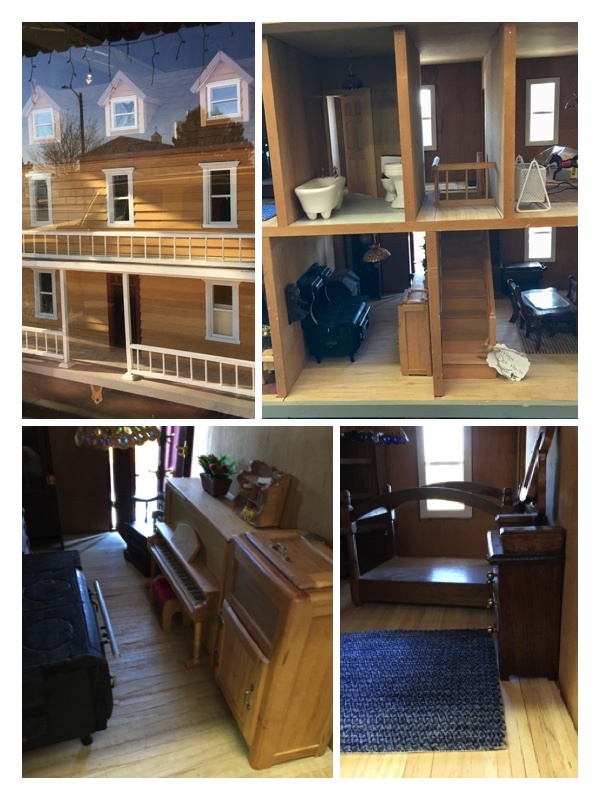 Your dollhouse is so pretty with its tiny bits and pieces, including the piano and the hutch. Winter is a good time to have a break from garden work. Enjoy! Those little chocolate bunnies are adorable! And I love the 'new' house you are working on. It will be great fun. It's something I've always wanted but haven't run across many in my treasure hunts. Enjoy your week! 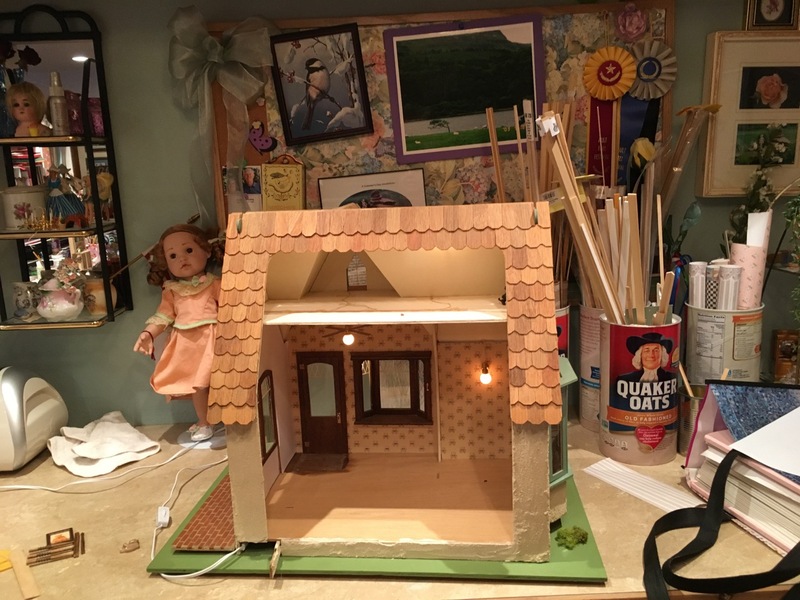 Wonderful birthday cake, and hooray for working dollhouse lights! Hello Ann, that was a good idea, to post on your dollhouse blog. I confess, I do not read blogs those days, too much going on right now. You are certainly a true artist with all these miniatures and your passion shows well! I am in awe with these tiny treasures and can see that you have huge patience to bring all that together. Remembers me EG's railway treasures. Happy belated birthday to your grandson, love his t-shirt. EG and his son have tickets for a Metallica concert in June... Obviously never out of fashion :-). Hi Ann, I've just come over from Garden Spot Blog to catch up with your news … and it's a lovely post and pictures.